Bestselling text introducing the scripture of Islam. Second Edition includes free MP3 downloads. 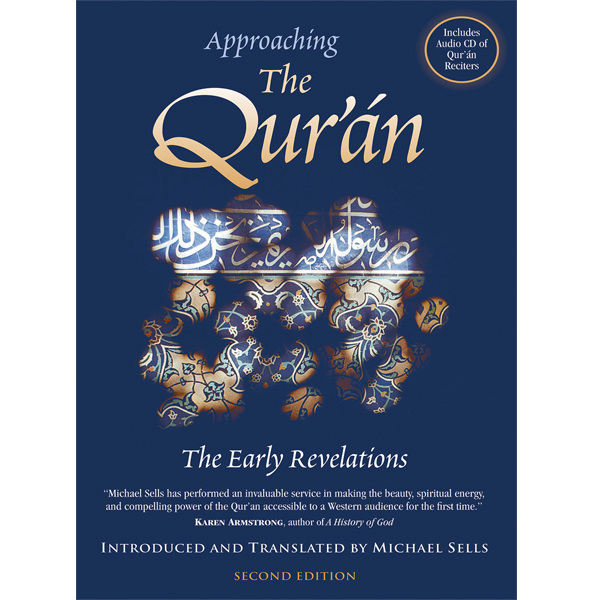 Approaching the Qur’an is a major event in religious publishing, Professor Michael Sells has captured the complexity, power, and poetry of the early suras of the Qur’an, the sacred scripture of Islam. In this 2nd edition, Sells introduces important new translations of Quranic suras and a new preface that addresses the ongoing controversy over teaching about Islam and the Quran in American universities. This book presents brilliant translations of the short, hymnic chapters, or suras, associated with the first revelations to the Prophet Muhammad. Most of these early revelations appear at the end of the written text and are commonly reached only by the most resolute reader of existing English translations. These suras contain some of the most powerful, prophetic and revelatory passages in religious history. They offer the vision of a meaningful and just life that anchors the religion of one-fifth of the world’s inhabitants. Approaching the Qur’an is enriched by the recording of Quranic reciters chanting several of the early suras, allowing readers an opportunity to hear the Qur’an in its original form. These recordings are now available as MP3 downloads free with the purchase of the book. The book includes Sells’ Introduction to the Qur’an, commentaries of the suras, a glossary of technical terms, and chapters discussing the sound nature and gender aspects of the Arabic text. Scholars and students interested in the Qur’an are indebted to Michael Sells for his outstanding contribution to a deeper understanding and appreciation of the Holy Book of Islam. His book, Approaching the Qur’an, with its scholarly introduction, its sensitive English translation of the early Suras, its insightful commentary on them, its analytical study of the auditory and literary aspects of selected Suras, its visually pleasing illustrations from the Arabic text of the Qur’an, and its accompanying CD is a veritable and enriching spiritual experience for everyone seeking a meaningful exposure to the Scripture of Islam.